Do your everyday adventures leave you with a thirst that's out of this world? 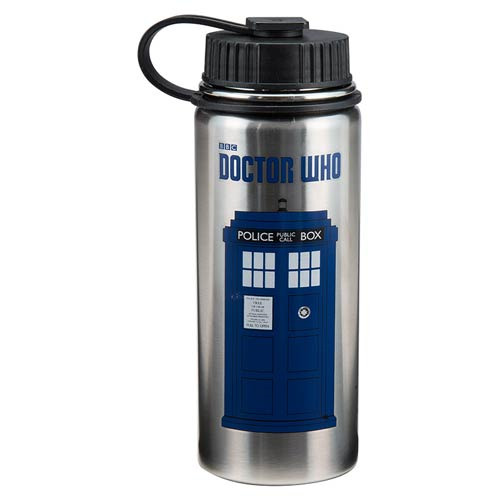 Quench it with this BPA-free, reusable, and recyclable vacuum-sealed Doctor Who 18 oz. Stainless Steel Water Bottle with a bold and bright TARDIS design. The loop-top cap offers greater functionality, and the wide mouth makes it easy to clean and add ice. This 8 1/2-inch tall bottle keeps drinks hot or cold for about 6 hours! Hand wash only. Not dishwasher safe. Do not microwave. Ages 13 and up.